Meet Number Nine – an orphan, a spy, a lover…a master of disguise, an assassin, a shapeshifter…a freedom fighter, a human chameleon, a reformed contract killer. He’s all of the above. He’s none of the above. 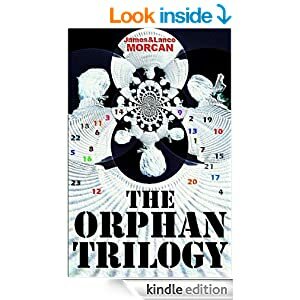 It’s his story we tell in our international thriller series THE ORPHAN TRILOGY (The Ninth Orphan / The Orphan Factory / The Orphan Uprising). Nine is enslaved by the Omega Agency, a shadowy organization seeking to create a New World Order. When he tries to break free and live a normal life, Nine is hunted by his mentor and father figure, and by a female orphan he spent his childhood with. On the run, his life becomes entwined with his beautiful French-African hostage and a shocking past is revealed…A past that involves the mysterious Pedemont Orphanage in Chicago, Illinois. Standing in the way of Nine’s freedom are his fellow orphans – all elite operatives like himself – who are under orders to terminate him. Nine finds himself in a seemingly infinite maze of cloak and dagger deception. Time and again, he must call on all his advanced training to survive. But can the ninth-born orphan ever get off the grid? To find out you’ll need to go on a tumultuous journey around the world to such far-flung locations as the Arctic, Asia, Europe, the Amazon, Africa and South Pacific islands. One of the Omega Agency’s black ops employs MK-Ultra mind control technology on genetically engineered agents to facilitate the agendas of those in power. When Nine successfully deprograms himself from MK-Ultra, all hell breaks loose. But to gain his freedom he must bust out of the Pedemont Orphanage and break into Omega’s other orphanages and underground medical laboratories around the world. In the process he uncovers chilling scientific experiments taking place on children. Subliminal messaging…How widespread is it?